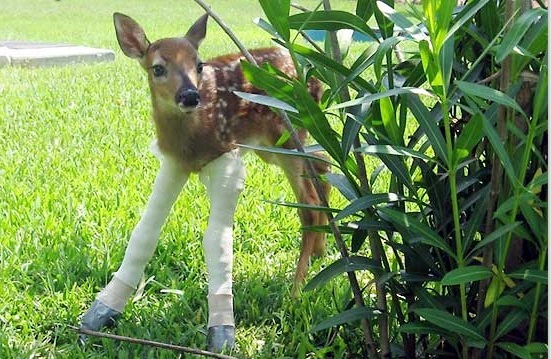 The FoxNest Veterinary Hospital is a drop off and first aid station for injured wildlife. We are not wildlife experts, trained in rehab, nor are we set up properly to handle wild animals except on an emergency basis. 2. We treat and fix-up the not so badly injured and either release the creature back into the wild or foster the animal for care until it's ready to be released. 3. If the animal is a bird of prey or an endangered species or a species requiring a permit to have (such as deer), we'll render first aid and contact a licensed rehabilitator to take over. * Unfortunately, we don't have enough money to take care of the nearly one hundred calls a year we get each Spring and Summer to take care of all the baby squirrels, baby possums, bunnies, and song birds that people find and bring in. So there is a small fee to take care of these types of animals...usually $10-15. While we will help any wild animal you bring to us, we are officially supposed to discourage the public from handling wildlife...for the very good reason that it's dangerous. Rabies is a real possibility and frightened animals...even babies...bite, scratch, kick, and gouge. You are at your own risk. About our Shelter; The Animal Rescue Fund of South Carolina. Some of the money we hope to raise will be used to take better care of injured wildlife brought to our clinic. (TWA) was formed in1985 by a group of ranchers and wildlife managers dedicated to the conservation, management, and enhancement of wildlife and wildlife habitat on private lands. Today, TWA serves as an advocate for the benefit of wildlife and for the rights of wildlife managers, landowners and sportsmen in educational, scientific, political, regulatory, legal and legislative arenas. (WCFA) protects and defends America's wildlife conservation programs and the pursuits -- hunting, fishing and trapping -- which generate the money to pay for them. The WCFA is responsible for public education, legal defense and research. Its mission is accomplished through several distinct programs, coordinated to provide the most complete defense capability possible.